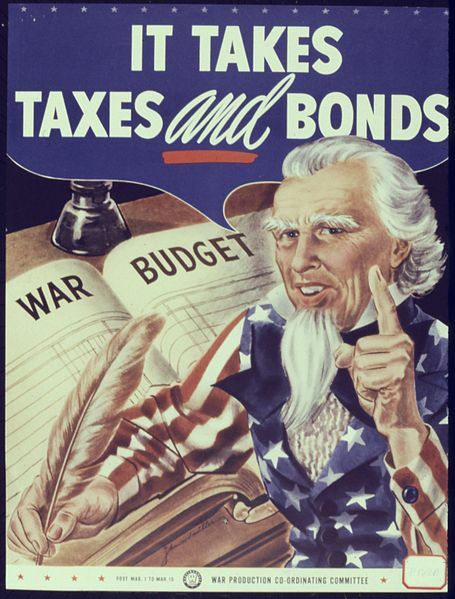 This poster, distributed by the Office for Emergency Management and the War Production Board, enjoined every American to pay his or her taxes and to buy war bonds in order to "beat the Axis." The use of such propaganda capitalized on what historian Mark Leff has called the "politics of sacrifice" and enlisted all Americans -- soldier and civilian alike -- in the war effort. 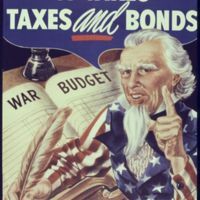 Author unknown, “It Takes Taxes and Bonds,” The American Century, accessed April 20, 2019, https://americancentury.omeka.wlu.edu/items/show/31.